WataugaWatch: Does Boone Have "Character" and Is This Compatible With It? Does Boone Have "Character" and Is This Compatible With It? This proposed new development is a big toad on a little lily pad. But it's also a large parking deck wrapped (and disguised) as an apartment building. 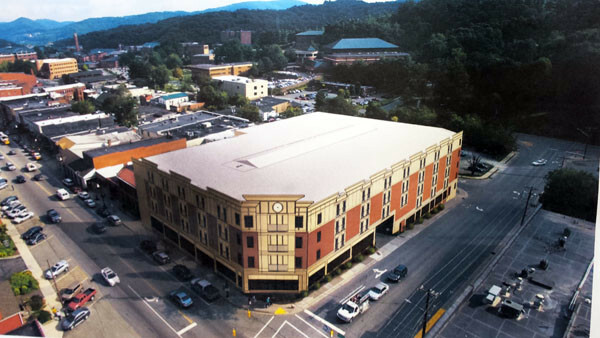 Boone needs downtown parking, and this large building will offer 333 parking places. So there's that. It will be commercial, for-profit parking, but what would we expect when the town of Boone cannot build its own parking deck? The developers have limited the apartments to 100 1-bedroom, 31 2-bedroom, and six 3-bedroom units. No 4-bedroom units, which is what most new student housing in Boone has offered for lease. So there's that too. The housing concept would seem to appeal more to older, quieter students. However, every apartment has an open balcony, which might give neighbors up the hill pause in contemplating a summer "party night" at The Marketplace. That the developers are open about marketing to Appalachian State University undergraduates is a likely downside for downtown Boone, as is the out-of-all-proportion size of this proposed development. Is it to be a high-rise dormitory smack in the middle of town? Or a genuine shopping destination with restaurants and shops on the ground floor with convenient parking? This development, like "Rivers Walk" two blocks away at the corner of Water and Poplar Grove Rd., is on a whole new permitting track, a "planned development," established by the Boone Town Council. The process puts much more power in the hands of the developers and cuts out the Board of Adjustment altogether, which means it cuts out the public's ability to present substantial, material, and relevant evidence in opposition. So much now depends on if and how the developers ask their architect to redesign the exterior to lessen the impression that a large toad has moved onto a very small lily pad. The title above alludes to something attorney Jim Deal, who represents the developers, said at the beginning of the community meeting. Mr. Deal asked, rhetorically, if Boone has a definable "character," indicating, I thought, that he very much doubted that it did and was therefore not at all concerned that The Marketplace might be out of keeping with it. I don't know if Boone has a particular character, but I've always thought that if you can't stand across the street from a building in Boone and see a mountain ahead of you on the horizon, you shouldn't be putting up that building in the first place. The picture is very deceptive as it makes the proposed development appear only slightly higher than the Murphy's building when in fact it is more than 2 stories taller in the front and is 6 stories in the back. This is the wrong place for this monstrosity. The Town of Boone's own lot next to town hall is much more suitable, but of course and as usual, John Winkler and Jim Deal will get exactly what they want because they have the connections. Deal made the point, as he always does, that his family has been here for seven generations. I assume Deal himself has not lived here that long, but despite the massive amounts of money these developers have made from outsiders, they continue to hold the position that their ancestors give them the right to destroy whatever they wish. I was at the so-called neighborhood meeting. When I tried to raise a point about the possible traffic snarls on Water Street which this monster building is going to cause, I was actually shouted down by the developers. What a great process! I feel very satisfied in knowing that my input will be taken so seriously. . . . That's sarcasm. Truly, with this PD process, the town has now created a monster which essentially has ended the existence of zoning in Boone. As enacted, the PD process is a terrible mistake. This won't be the last destructive proposal which will be coming down the pike. As for this building, it's going to have impacts far beyond King and Water streets. The noise from its highly touted balconies will be heard in the neighborhoods behind Queen Street. So much for neighborhood protection. The character of Boone and Watauga County seems to be "money talks." That huge building on 321 - how will that ever see full occupancy? What happens if that goes belly-up? The "retail on the first floor" does not really seem to be working in Boone. And I think it's awful that student rents subsidize weak businesses on the first floor. There are ways to develop without destroying the character of a town. The developers and out-of-state asphalt companies pull the strings here. Here's to hoping Soucek's ETJ bill is not reinstated by the NC Supreme Court! Anon 7:24 PM. This is happening under the supervision of the Boone Town Council. You do realize they will control the ETJ if it fails in court and you will have urban sprawl in more territory than the current jurisdiction from folks for whom you cannot even vote into or out of office.